I'm not a morning person in the slightest. When my alarm goes off, I immediately hit snooze and fall back asleep. After the seventh ring of my alarm, I stare up at the ceiling and mutter a pained Whyyyyy? before rolling off my mattress and onto the floor. It's not a pretty sight. Begrudgingly waking up in the morning has nothing to do with not wanting to start my day. When I do get an early start, I relish in the fact that I'm being proactive and making moves, if you will. But the act of actually getting out of bed pains me—literally. My body becomes one with the mattress each night, so much so that mustering up the strength to lift my body is as if I'm wearing a heavy suit of armor. My eyes also burn every morning having been so tired the night before. Coffee is the only thing that can bring me back to life from the state of undead that I'm in. I repeat: I am not a morning person. After sifting through the customer reviews, most of which gave the product five stars, I felt confident purchasing it. However, after browsing the ingredient list—caffeine, cellulose, dicalcium phosphate, stearic acid, carborner homopolymer, hydroxypropylmethylcellulose (I know), magnesium stearate, sodium bicarbonate, etc.—and not being able to pronounce half of them, I decided to speak with my physician first—just to be on the safe side. I brought a packet into his office to give them a look. "200 milligrams is equal to two cups of coffee, which is about what you drink daily, so I don't see the harm," he explains before warning me, "Just don't use them too often." Because I have so much trouble fully waking up, I was hoping I could use these consistently, but—doctor's orders. The way the pill works is that it has time-released caffeine that will wake you up seven to eight hours after taking it. Knowing this, I went to bed at 11 p.m. with hopes of waking up bright-eyed and bushy-tailed at 7 a.m. However, falling asleep was a bit of a struggle. I was wide awake, and I made it through an entire episode of Fallon (most nights I don't make it past the monologue). Strike one, I thought. But the next morning, I actually did wake up at 7 a.m. feeling very awake. I hopped out of bed and went into the living room to watch some Saturday morning television, but I felt sleepy within an hour. Then I did something I'm not proud of: I took a nap. An hour after waking up. Don't say you've never done it before. Strike two. I woke up and went about my day, making a pit stop at the coffee place up the street for my usual soy iced coffee. But as the day wore on, I started feeling a little sick. I was feverish, my heart was beating a bit faster, and I needed to stick my head in the closest A/C unit. It was pretty wild, and I figured it was just due to the extra dose of caffeine. Never mind the fact that my body was also tingly. I came home and chugged water and relaxed for a bit, hoping it would wear off quickly. It did, but it was a bit scary. I skipped the next few days to give my body a break. Thursday came around, and I popped the supplement at 11 p.m. I felt very alert again and worried I'd have trouble falling asleep, but within about 15 minutes, I wandered off to dream land. The next morning (around 7:30 a.m.), I woke up not as alert as the first morning I took the supplement, but I felt much more awake and ready to go than on a non-supplement morning. Staying awake was also much better that morning, and I definitely didn't need a single cup of coffee (I'm sure it's better that I didn't have one). I powered through my workday feeling completely focused, no midday slump in sight. However, the jitters returned, and I felt a bit off again. Strike three. All in all, these supplements definitely work, but I don't love the way they make my body feel. 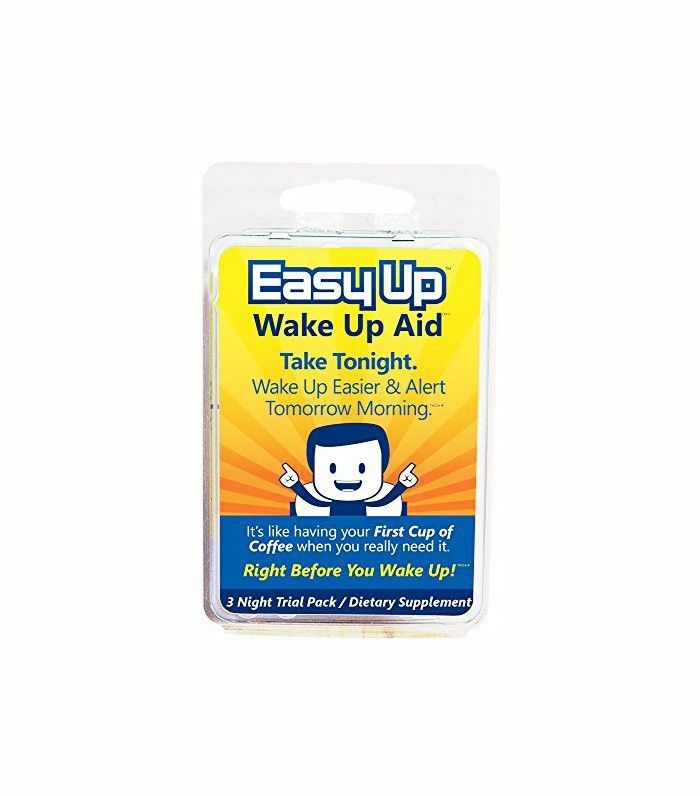 As much as being awake and alert sans coffee is nice, the rapid heartbeat and jitters were enough to scare me away from using them weekly, so I think I'll save the next pill for my red-eye or something. For now, I guess it's back to being one with my mattress. What tricks do you use to help you wake up in the morning? Please sound off below!